Source Optimized DNA sequence encoding HumanBrain Derived Neurotrophic Factor mature chain was expressed in Escherichia Coli. Molecular weight Human native BDNF is generated by the proteolytic removal of the signal peptide and propeptide, the molecule has a calculated molecular mass of approximately14 kDa. RecombinantBDNF is a disulfide-linked homodimeric protein consisting of two amino acid residue subunits. migrates as an approximately27 kDa protein under non-reducing conditions and as a-14 kDa protein under reducing conditions in SDS-PAGE. Biological Activity The ED(50) was determined by the dose-dependent proliferation ofrat C6 cells, and was found to be in the range of0.5 ug/ml. Presentation Recombinant Brain Derived Neurotrophic Factorwas lyophilized from a.2 μm filtered citric acid, pH.7. After 6-8 (early) and 20-30 (late) passages, iPSC and late-passage (30-40) ESCs were subjected to neural differentiation according to a previously established procedure for ESCs (Figure 4 (iPSC) or 5 × 104 (ESC) cells per ml to allow embryoid body (EB) formation. Differentiation medium was changed at day 3. On day 5, EBs were plated en bloc on tissue culture plates or chamber slides double-coated with poly-D-lysine (200 μg/ml) and mouse laminin (10 μg/ml) at a density of 1-2 × 102 EBs per cm2 in fresh medium. Before plating, EB were imaged to assess size and shape. At least 50 EBs were analyzed using MetaMorph software to determine the average EB diameter for each biological replicate. Twenty-four-thirty-six hours post plating, the medium was changed to neural induction medium containing GMEM, 1% N2, 2 mM glutamine, 1 mM sodium pyruvate, 0.1 mM nonessential amino acids, 0.1 mM 2-mercaptoethanol, 0.01% penicillin streptomycin and 10 ng/ml brain-derived neurotrophic factor (BDNF) . Neural induction cultures were maintained for 3, 7 or 15 days before cells were harvested for RNA extraction, electrophysiological recordings, flow cytometry analysis, or fixation with 4% paraformaldehyde for immunocytochemistry. 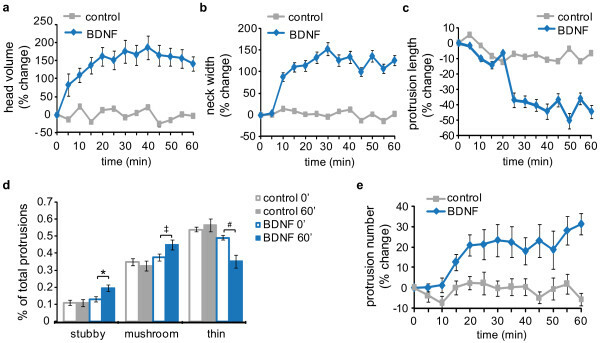 Acute BDNF treatment induces maturation of the dendritic spine population. 11 DIV hippocampal neurons were transfected with a vector expressing Lifeact-ruby, and 24 hrs later, the neurons were treated with vehicle or 100 ng/ml BDNF followed by time-lapse imaging every 5 minutes for 1 hr. To differentiate NPs to neurons, NPs were plated on polyornithine and laminin coated plates in NP media and grown until they reached 70% confluence. FGF was removed and NP media supplemented with 20 ng/ml BDNF , 20 ng/ml GDNF and 0.5 mM dibutyryl cAMP (N6,2′-O-Dibutyryladenosine 3′,5′-cyclic monophosphate sodium salt). Medium was exchanged every 2–3 days. iPSC cultures were dissociated with Accutase to generate single-cell suspensions, then differentially plated on gelatin-coated plasticware for 1 h in medium'>hESC medium in the presence of ROCK inhibitor (Y27632, Ascent) to remove SNL feeders. The nonattached cells were resuspended in MEF-CM (&systems) with 10 ng ml−1 FGF2 and plated on growth-factor reduced Matrigel (B) at a density of 25,000 cells cm−2 and allowed to propagate in self-renewal conditions for 72 h or until 70–90% confluent, whereupon media was changed to KS medium containing 50 ng ml−1 Noggin , 10 μM −1 SHH C24II and 50 ng ml−1 Wnt1 for the second day onwards. kk1 blocking antibody (100 ng ml−1& ) was also added for the second day only. After 5 days, medium'>medium'>KSR medium'>medium containing these ligands was cross-tapered with medium'>N2B27 medium'>medium (Cells) containing the same ligands over 7 days (75% medium'>medium'>KSR and 25% medium'>N2B27 first day, 50% of each third day, and 25% medium'>medium'>KSR with 75% medium'>N2B27 fifth day). Once established in N2B27 conditions, Wnt1, Noggin, SB431542 and −1 BDNF , 0.2 mM ascorbic acid and 100 ng ml−1 FGF8 were added. Three days later, cells were dissociated with Hank's buffered saline solution for 1 h at room temperature, and lifted mechanically, then replated en bloc on to poly-l-ornithine/laminin-coated plasticware. Neuronal maturation ensued with BDNF and ascorbic acid as before, supplemented with 10 ng ml−1 GDNF , 1 ng ml−1 TGFβ3 and 0.5 mM dibutyryl-cAMP for the next 7 days. After a total of 23–31 days, the resulting neuronal cultures were analysed by immunocytochemistry, qPCR and western blot.